Students and activists are taking direct action over what some have called the nation’s next financial crisis: the more than $1.2 trillion in student loan debt. The massive cost of U.S. college tuition has saddled millions with crushing debt and priced many others out of the classroom. Now, 15 former students of the for-profit Corinthian Colleges system have launched what they say is the nation’s first student debt strike. The students have refused to pay back loans they took out to attend Corinthian, which has been sued by the federal government for its predatory lending. Meanwhile, another activist group has announced it has erased some $13 million of debt owed by students of Everest College, a Corinthian subsidiary. 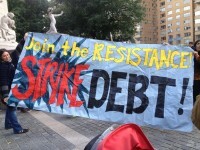 The Rolling Jubilee uses donated funds to purchase debt at discounted prices, then abolish it. We are joined by two guests: Laura Hanna, a filmmaker and activist who helped launch Strike Debt’s Rolling Jubilee initiative, and Latonya Suggs, a student debt striker in the “Corinthian 15” who is $63,000 in debt after completing a two-year program in criminal justice at Everest College. More than 2,000 firefighters have attended a rally in Westminster to protest about changes to their pension scheme. It was organised by the Fire Brigades Union (FBU) to coincide with strike action across England. The FBU says changes to pensions and the retirement age are “unworkable”. (Reuters) – The largest U.S. refinery strike in 35 years could spread if talks over improved safety conditions do not resume soon, United Steelworkers union (USW) International President Leo Gerard said on Tuesday. A total of 6,550 USW members are on strike at 15 plants, including 12 refineries accounting for one-fifth of U.S. capacity. Union members work at more than 200 oil terminals, pipelines, refineries and chemical plants in the U.S. The USW has said it is seeking to retain safety provisions from previous contracts and tighten fatigue standards for workers, as well as win back daily maintenance jobs now done by non-union contractors. SOME 5,000 union members represented by the United Steelworkers (USW) are on strike at 11 refineries in six states, and counting. 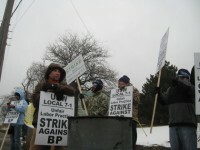 Workers at BP refineries in Whiting, Indiana, and Toledo, Ohio, joined the strike this week. The union could bring out more than 30,000 workers at 63 refineriesplus related oil terminals, pipelines and petrochemical facilities, which would dramatically affect oil production. The oil workers are fighting energy giants who put their multibillion-dollar profits ahead of the health and safety of their employees and the surrounding communities, whom they treat as disposable. Workers are demanding that the oil corporations address safety issues on the job, including forced overtime and outsourcing of work to contractors. The focus of our involvement in the COP should not be on the COP at all. We should instead focus on building a social strike, causing economic disruption to prevent accumulation of the corporations who are causing this crisis. Many of us will be in Paris, and that is positive, it is a chance for the climate movement to come together, but we should not make the mistake of participating in the customary occupy camp and protests at the gates of the conference centre in Le Bourget. Instead we should work towards a transnational climate strike.